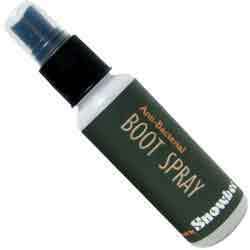 Snowbee Boot Spray, this unique new product, exclusive to Snowbee, keeps Waders & Boots fresh & free of odours & mould.There is no getting away from it - after a hard days fishing waders & wellies are NOT the most pleasant smelling things on the planet! Snowbee wader fresh & boot spray are products developed by Snowbee Bioscience to provide the solution to an age old problem - smelly feet! These two hi-tech sprays are derived from Chitosan. A totally natural, biodegradable product, extracted from the shells of Shellfish. Chitosan has natural antimicrobial, antiseptic, deodorant and fungicidal properties. Easy to apply to Waders, Boots, or any type of Footwear, to keep them fresh and reduce foot odour. The ready-to-use, non-toxic sprays should be sprayed inside any type of footwear, as a natural aroma refresher before wearing, or during storage. The totally natural properties of Chitosan inhibit the growth of bacteria responsible for unpleasant musty odours. Chitosan will also inhibit Trichophyton mentagrophytes, and other fungal growths on the skin or inside shoes & boots. This resistance to the development of fungus and bacteria, helps prevent athlete's foot and other kinds of dermal disease. Chitosan adsorbs the acidic materials generated in Boots & Waders, by microbes, leaving them with a fresh, pleasant smell. Laboratory tests conducted by the International SGS Group, concluded that both Wader Fresh & Boots Spray caused a reduction in the 2 separate Test Bacteria's. Staphylococcus aureus & Klebsiella pneumonia of over 99.9% over a 24hr period compared to the Control specimens. NEW, convenient 70ml hand-pump packaging*Laboratory Tests conducted by SGS Taiwan Ltd.